One of my family’s favorite activities is to walk the neighborhood and see all the pumpkins. Some are carved, some are whole, some are dressed as characters, some have Fort Thomas Matters stickers affixed to them, and a few are painted teal. 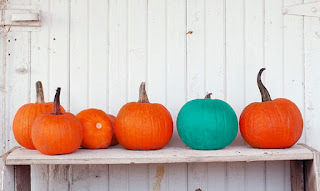 Have you noticed any such teal-painted pumpkins? They are striking in how they stand out from the other pumpkins around them; striking enough it caused me to research what these teal pumpkins are. As it turns out, these teal pumpkins are part of a coordinated effort called The Teal Pumpkin Project. The project, sponsored by Food Allergy Research & Education (FARE), is aiming to bring attention to the fact that Halloween is not a “safe” holiday for the 15 million Americans with food allergies. I’ve seen firsthand how difficult of a holiday this can be for children with food allergies. My son has a severe peanut allergy and our first Halloween came with far more tears than candy as he handed over peanut butter cup, followed by Butterfinger, followed by Snickers bar. The next year, we purchased our own bag of candy and “traded” his peanut candies for our “safe” ones. However, children with soy, milk, gluten, nut, and many other allergies, may not have even that capability and thus are forced to either not participate in trick-or-treating, or participate but feel left out by the treats given out. 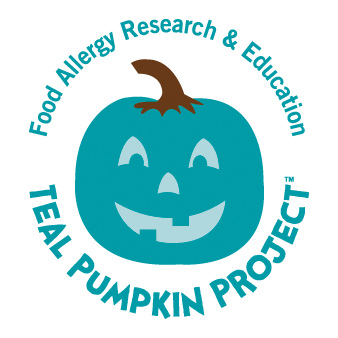 Enter The Teal Pumpkin Project which is attempting to raise awareness of food allergies and asking willing families to take a pledge. The pledge, which is over 100,000 strong, commits families to having a non-food treat such as pencils, small toys, bouncy balls, etc., for children suffering from food allergies so they can still participate in Halloween. It is not attempting to replace those yummy Peanut Butter Cup treats but merely asking families to have both options. 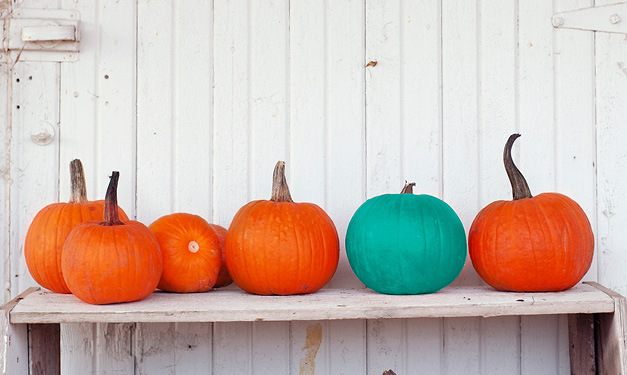 A household signifies that it is allergy-friendly by placing a teal-painted pumpkin on the front porch. FARE began this project just last year in 2014 and participants readily embraced it with people from all 50 states and seven different countries participating. So, if you see a teal pumpkin (and there will be one on my porch this year), now you know what purpose it serves. Now you know that a child, who usually has to sit Halloween out, can enjoy the festivities like all the other children can. If you’d like to participate and/or find out more about The Teal Pumpkin Project or FARE, visit their website. If you choose to participate this year, spread the word by posting photos of your pumpkin to social media and use the hashtag #tealpumpkinproject. Wonderful article! Thank you for promoting the Teal Pumpkin Project! !